If your IRA custodian is a big bank or a brokerage house, chances are your investments range from stocks and bonds to mutual funds. Your decisions may be limited to how much of each of those asset classes you own. This report explains the types of real estate an IRA can invest in and the IRS rules that are related to these types of investments. Being familiar with the rules will help you avoid jeopardizing the qualified status of the retirement plan. Lastly, the report walks you step by step through the process of investing in real estate using your self-directed IRA with The Entrust Group. You can own real estate in a Traditional or a Roth IRA. In both cases, the assets in your IRA grow tax-free over time. The big difference is once a set of requirements are satisfied in a Roth IRA, the earnings are distributed tax-free. 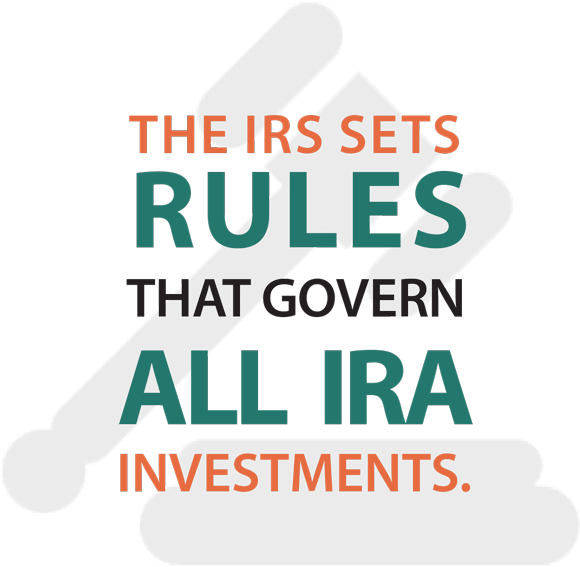 The IRS sets rules that govern all IRA investments. Many of the rules governing real estate in an IRA relate to the kind of transactions you may not make and the people you may not do business with. Breaking these rules could result in the asset being distributed immediately, triggering taxes and penalties. A self-directed IRA cannot own any property that is used for the personal benefit of the account holder or any disqualified person. For example, you cannot live in a house owned by your IRA. These are people who cannot benefit from the property owned by the selfdirected IRA. This includes the account holder, their parents, grandparents, spouse, children, and grandchildren and their spouses. These are called “lineal ascendants and descendants.” For example, you cannot rent an auto repair shop owned by your IRA to your child. If you own a business, that business cannot benefit from your self-directed IRA real estate investment. For example, if you own a pool-cleaning service, you cannot hire your own business to maintain the pool at an apartment building owned by your IRA. The account holder acting as property manager. All rents must be paid directly to the IRA. Likewise, the money used to pay the property manager must come from the IRA. The account holder cannot do any repair or maintenance work on the property. Neither can any other disqualified person, such as a child. This kind of work must be done by a third-party and services paid for by the IRA. Ready to take the first step to investing in real estate in your IRA? 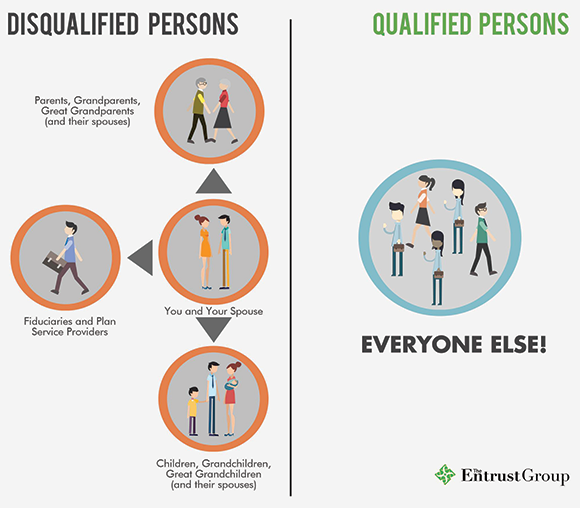 The Entrust Group has developed forms and procedures that make it easy to open a self-directed IRA. 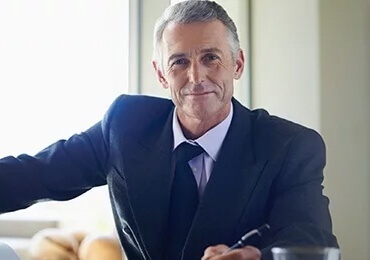 And while our website provides a complete overview of what you’ll need to open an account, it’s our staff who are credentialed as Certified IRA Services Professionals, (CISP) who really make the difference. Our clients are more than account numbers in a database. Each client works with a dedicated representative at one of the offices in our nationwide network. Your calls and emails will be answered by a familiar voice, someone who knows you, your account, and your retirement goals. Decide on How You Will Fund Your IRA and Your Real Estate Investment. 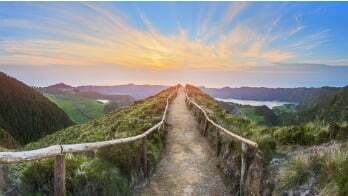 You can fund your self-directed IRA in three ways and You have several choices when it comes to funding your real estate purchase. Transfer funds from an IRA you have with another custodian. Transfers do not prompt reporting, taxes, or penalties because they are not considered distributions. Transfers only occur between like plans. Rollover funds from another IRA custodian. If the rollover is from a previous employer’s 401(k), 403(b) or governmental 457(b), that is considered a direct rollover. Unlike transfers, the rollover transaction is a reportable event given that the initial transaction is a distribution. Therefore there is no guarantee that the IRA holder will roll the distribution back into an IRA. It is reportable as it is distributed and will be reported again as it is contributed into the new IRA. Rollovers must be completed within 60 days of taking the money out of the original account. Contribute new money from your personal funds to your new self-directed IRA. Fund your real estate purchase. Make a direct purchase using liquid funds in your IRA. This is the simplest and quickest way to buy property. Your IRA pays cash for the investment property and holds title to the property. Partner your IRA funds with other personal funds, with money in another IRA owned by you, or with personal or IRA funds owned by another person. You divide the investment according to each investor’s investment amount. Learn more about partnering in our free report: Partnering Self-Directed IRAs. Make a leveraged purchase. Your IRA may borrow money to purchase a property with a non-recourse loan. Most banks and credit unions do not offer non-recourse loans, but The Entrust Group works with many non-recourse lenders. Working with a qualified, knowledgeable real estate professional is one of the best moves you can make. They are familiar with the local market and will work with you to look for properties that meet your needs. If you want a steady revenue stream, you will want to look at rental properties. If you are interested more in asset appreciation, vacant land ripe for development may suit you better. What you can buy will depend on your local real estate market. Remember, you can partner with others, get a non-recourse loan, or form a limited liability company for the purchase. People unfamiliar with the concept may hesitate. Once the contract is executed, Entrust will use your IRA funds to pay the earnest money deposit. You and your real estate broker open escrow. When Entrust has completed its review, we will fund the balance due on the purchase and the property will belong to your Real Estate IRA. I don't mind paying fees. Because of Entrust, I purchased a great house with my IRA and I am receiving monthly payments equaling about 9 percent return. Entrust has made my future more stable and predictable. Thanks Entrust. As the owner of the property, all related income and expenses have to flow through the IRA. That means rent checks are sent to your property manager or directly to The Entrust Group. If you employ a property manager or need to hire a plumber to make repairs, they are paid directly from the IRA. In addition, all agreements for property management services, insurance policies, and tenant agreements must be made in the name of the IRA, not you as an individual. Read more about how to manage property in your Real Estate IRA and about how The Entrust Group myDirection Visa® Prepaid Card makes it quick and easy to pay for supplies and services. The Entrust Group’s trained representatives will be happy to explain how real estate investing with a self-directed IRA can add to your retirement savings plans.